Day Dreaming doesn’t need to stay in your head, Turn Your Imagination Into Full Photos. 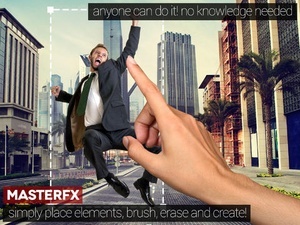 MasterFX is finally here and it will make you the Master of Designers ! 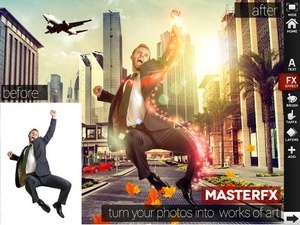 MasterFX will blow your mind out literally, just like a puzzle, MasterFX allows you to literally build a photo and make it come to life. No need to learn fancy photo editing techniques, its simple and suits everyone ! And the results are outstanding! Your friends won't believe that you made it by yourself! 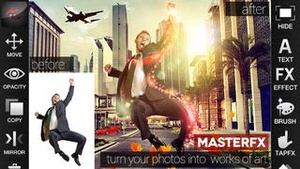 With Master unleashing your creativity is as simple as choosing from its vast library of elements, effects, fonts and filters. Choose from over 1,000 effects organized into 32 categories Characters Animals, People, Fantasy, Dragons, Warriors, Heroes, Creatures, Robots. Design Tools Abstract, Color Splashes, Light Decoration, Music, Textures, Text Labels, Tribals, Frames. Scenery Jungle, Bridges, Buildings, Mountains, Roads, Skies, Rivers, Travel, Fields, Water. Surreal Destruction, Horror, Jungle, Science Fiction. Use the builtin brushes to add enhancements by brushing, The TapFX lets you tap for random effects that turn your photo from ordinary to extraordinary ! 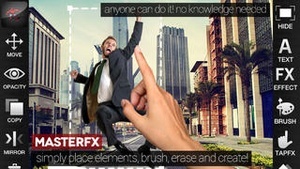 The MasterFX gallery lets you browse millions of photos, you can implement them in your creation. Using the Mask Tool will let you remove any undesired parts, you may incorporate your own photos, and add a filter for the perfect blend. 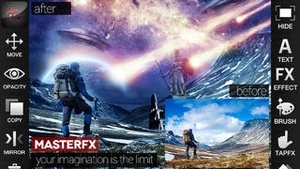 MasterFX Highlights Real Time Rendering. 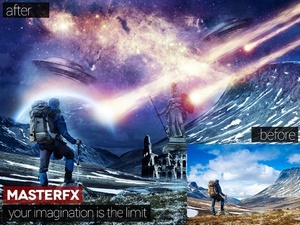 1,000 amazing photo effects. Move, scale, rotate & distort. BuiltIn Advanced Text Editor 50 fonts & 100 textures. Built In Frames & Text labels. 50 TapFX. 50 Brushes. Advanced Tools Opacity, Mirror, Layers Manager, Mask. Photo Filters. Photo gallery with millions of photos to choose from. Retina Support. IPhone5 support. Export in resolution. 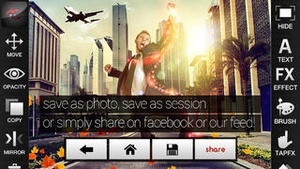 Developed by Dropico Mobile The team that brought you FilterMania2, Instafonts, WowFX , Brush Tap ColorMania & PopFX. For any questions or comments please visit http//support.dropico.com Or contact us on help@dropico.com We are more than happy to help, Dropicomobile Team. 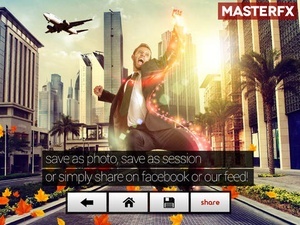 Check these links to find your download for MasterFX HD for & iOS or for your device iPod TouchiPhoneiPad. 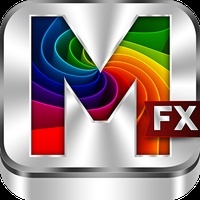 The app MasterFX HD is compatible with te following devices.